Teachers from government and non-government schools, TAFE and early childhood centres can now apply for the NSW Premier’s Copyright Agency Creativity across the Curriculum Scholarship, which has been supported by our Cultural Fund since 2012. The $15,000 grant is one of 19 NSW Premier’s Teacher Scholarships, which offer unique professional development opportunities through funded study tours in Australia and overseas. The Creativity across the Curriculum Scholarship allows teachers to visit leading institutions and learning centers around the world, to gather insights they can develop and apply in the classroom. Kelly Evans (pictured), Head Teacher of Technological and Applied Studies at Lumen Christi Catholic K–12 College (Pambula, NSW south coast), was awarded the scholarship for 2019. She is researching textile technologies and has just finished the first leg of her tour through Cambodia, Laos and Vietnam, where she observed traditional hand embroidery, appliqué and weaving techniques passed down through generations of women. 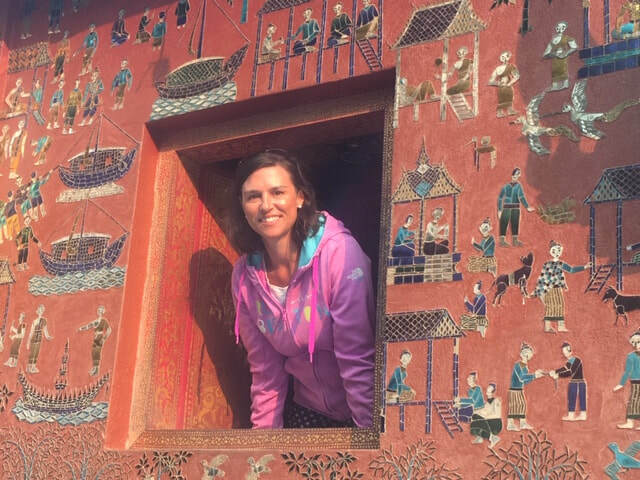 Kelly Evans at the Wat Xieng Thong temple, Luang Prabang, Laos. Photo courtesy of Kelly Evans. Ms Evans, who is also a Copyright Agency author member, will now go on to London to visit an innovation hub developing wearable technology. She says her scholarship has allowed her to immerse herself in aspects of textiles that she has only ever read about. Applications for the NSW Premier’s Teacher Scholarships close at midnight on 28 April 2019. Learn more and apply here.